When to the session of sweet silent thought, we summon up remembrance of things past… we may recall the name of Rachel Carson, marine biologist, writer and author of the epoch-making “Silent Spring”. The book demonstrated the harms done by the indiscriminate use of pesticides, harm particularly evident on birds. Pesticides, and notably DDT, accumulated in the food chain, damaged the environment and even threatened the symbol of American freedom, the bald eagle. For some historians, Silent Spring was to environmentalism what Uncle Tom’s Cabin was to abolition; the beginning of a new public consciousness. Yet, at the time, the pesticide industry fought back and bitterly. Her work was defined as anecdotal, unproven, inadequate and wrong. They even threatened Carson’s publisher with lawsuits. But her book was not anecdotal. It relied on extended research and field observations – examining the effects of the chemicals not only on birds but also on humans and studying the cancer-causing agents in pesticides. In recent years and clearly posthumously, various organizations have attacked Carson and labeled her a mass murderer. According to the accusers, Carson killed more people than the Nazis, because banning DDT caused “millions to die and suffer the consequences of malaria”. The point here is not to disprove the allegation – we know it is silly. But to set the record straight, one of the consequences of using pesticides – which is also an argument against Genetically Modified Crops – is that some insects survive and develop immunity. And given the short reproduction cycle of pests, pesticides become ineffective relatively quickly and new stronger ones have to be developed. The current mass extinction of bees is attributed to some not-yet-fully-established effect of some pesticides. This fact is ignored by Carson’s accusers. Interesting, however, are the personalities and the types of organizations that are in the forefront of the campaign to discredit Carson. They are the same who not so long ago fought bitterly to prove that smoking was “safe”. Currently, besides slandering Carson, they are bent on proving that environmentalists are “eco-terrorists” and that climate change is a hoax. Equally interesting are the tactics used in their endeavor and, importantly, the ideological background that inspires them. For example, according to the American Enterprise Institute, DDT was “probably the single most valuable chemical ever synthesized to prevent disease.” The Cato Institute tells us that “DDT is making a comeback.” The Heartland Institute, that also published articles in defense of DDT, has an extensive and continuing program to deny climate change. At the onset of the tobacco debate in the 1950s (actually German scientists had already demonstrated the link between tobacco and disease in the 1930s), the tobacco industry realized that they could protect their product by casting doubt on the scientists and insisting that the dangers of smoking were unproven. But to return to the environment, the Wall Street Journal argued that Carson promoted the attitude that “environmental controls were more important than the lives of human beings”. The New York Times also expressed similar views. An interesting character in this curious saga is Steve Milloy, who, in 1993 founded the Orwellian-sounding “Advancement of Sound Science Coalition”, financed by Philip Morris, the giant tobacco corporation. Objective of the “coalition” was to defend a product, tobacco, that had already caused millions of deaths. Steve Milloy is the same who promoted the rumor that banning of DDT has caused “millions of deaths” from malaria. He has equally made a name for himself for his attacks on any science related to environmental issues. Global warming he calls a swindle. Acid rain helps slow global warming although he does not believe in global warming anyway. And the ozone hole has no real significance. Where best to launch a disinformation campaign than on the web, with the support of familiar flag bearers. For example, the notorious Rush Limbaugh confirmed that Rachel Carson was wrong. For which stand (I assume), the “Competitive Enterprise Institute” (nomen omen), even promoted Limbaugh’s name for the Nobel Peace Prize! George Orwell called “memory hole” the system that destroys inconvenient facts and “Newspeak” the language designed to limit thought within political acceptable bounds. The friends of DDT and climate-change deniers call their science “sound”, while the evidence provided by serious studies is dismissed as junk. “Memory holes” enable misrepresentations and complete inventions, while Newspeak is the opposite of science. Science studies the world as it is, not as it wishes it to be. Therefore science is likely to challenge the status-quo, which happens to be very profitable to the corporations funding the “sound” discoveries of the Rush Limbaughs of this world. Science has demonstrated that Rachel Carson was right and that contemporary industrial civilization is not sustainable. Which is also why environmentalism has shifted from aesthetic – that is, a romantic effort to protect some of nature’s beauty from industrial chimneys, paved fields and subdivisions – to regulatory, to protect the earth from destruction. Besides empirical evidence, research has proven that unrestricted commercial activity causes real, lasting and pervasive damage. But to acknowledge this is to acknowledge that unrestricted free enterprise has costs that the free-marketeers wish to deny. Corporate economists have a new Orwellian term for such costs, “negative externalities”. They are negative because they don’t increase profit. And not being profitable they are external to the market system. But the costs of negative externalities are imposed on people who do not benefit from the economic activity that produce them. And so are the costs of DDT (destruction of the ecosystem), of acid rain, of the ozone hole, of second hand smoke and of global warming. Here is one common thread linking together these issues; they are and represent actual market failures. The “negative externalities” cause serious damage but the free market does not want to account for, let alone prevent them. Government intervention was and will be required. This ominous prospect has brought together lassez-faire ideologues and old Cold War warriors. When the Cold War ended its warriors were looking for a new great threat. They found it in environmentalism. 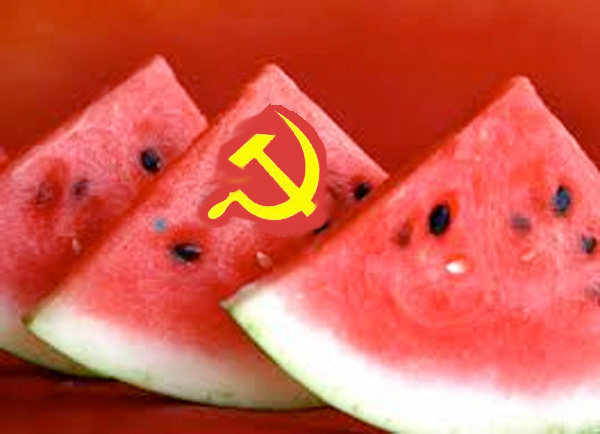 Environmentalists – they claim – are watermelons, green on the outside and red on the inside. In a remarkable marriage of the minds and reversal of palettes, the greens have become the new reds. And in another equally remarkable reversal, the science that is “good” when it builds nuclear bombs and other deadly weapons, is “bad” when it points to some unpleasant truths. One of the notable developments of the Cold War was a tested technique to market patent and obvious lies as true. The trail from the Tonkin Resolution to the Pentagon Papers and beyond, is strewn with masterpieces of mendacity. The Pentagon Papers created a crisis when they became public thanks to the rocambolesque plot carried out by Daniel Ellsberg. They were to remain secret because they contained the unpalatable truth about the Vietnam war. The doctrine of laissez-faire capitalism holds that the common good is best served by the uninhibited pursuit of self interest. Laissez-faire economic claims to be scientific, being based upon the immutable laws of nature – but experience has proven the doctrine false. Markets fail and sometimes they fail spectacularly, as during the Great Depression. Many people of various political persuasions admit that the New Deal was necessary to save capitalism. Interestingly, the term “free enterprise” and the notion of the “American Way” were invented and marketed by the business community, to promote the idea that the New Deal was dangerous. The latter-day climate-change deniers are the heirs of the Cold War and of the ideological enemies of the New Deal, starting with Ronald Reagan. These are the same folks claiming that the solution to the problem of hunger among the poor is to deprive them of food stamps – an idea they call “tough love”. Considering that now, in full free-market economy and rampant capitalism, the government controls all communications of all people at all time, readers will draw their own conclusions about the senselessness of these statements. Besides, some words, like “liberty” and “democracy” are so debased by their obvious misuse, that they no longer can be heard without the involuntary recollection of unpleasing images. According to Charles Krauthammer, a rabid right-wing Zionist, environmentalism is “socialism by another name, a brazen attempt to transfer wealth from the rich to the poor.” “With socialism dead – he says – a gigantic heist is now proposed as a sacred service to the newest religion, environmentalism… the Left was adrift until it struck upon the brilliant gambit; metamorphosis from red to green.” (The Washington Post). Among the patent lies marketed by the new Cold War warriors is the notion that technological innovation is only possible in free markets. Disregarding that many technologies crucial to the progress of civilization were invented before the advent of capitalism – and equally disregarding that the Soviet Union was a technologically innovative society. They launched the first artificial satellite into orbit, put the first man into space and sent the first probe to Mars. The problem with the Soviet Union was not the lack of technological innovation but a different set of priorities. And, as Dostoyevsky wrote in the preface to one of his novels, a genetic penchant for inefficient distribution. The Internet was mostly a technology developed with government funding, and so were the transistors and nuclear power. A more subtle method adopted by the new Cold War warriors to discredit science, is to distort its very meaning. Science is about the future. Future means chance and certainty about chance is an oxymoron. The new Cold War “scientists” use the argument of the inherent uncertainty of science by discrediting its conclusions based on research, however serious. Besides, Cold War warriors often flatter themselves with a high opinion of their own mind and look down on those who humble themselves with tiresome and time-consuming research, as a race of inferior beings. Another technique is to resort to vociferation, rather than argument, especially in their radio talk-shows. Which suggests that it is foolish to ignore global warming or pretend it is not happening. Unless the global-warming deniers wish to adopt the solution of the Bishop of Pisa at the time of Galileo. By improving the design of a telescope, Galileo discovered that Jupiter had satellites. This was contrary to all biblical tenets whereby all objects in the universe circle around the earth. The theological think-tanks of the time were in uproar. Then inspiration struck the bishop. He issued an advisory to the brethren, with a warning that it was sinful to look through a telescope because it showed objects that didn’t exist. Still, while attempting to acquaint myself with the reasoning of the new Cold War warriors and global warming deniers, I was comforted in discovering that I am a watermelon, which, to be sure, is better than a communist. In the play. Malcolm’s soldiers screened by branches, advance on Dunsinane, Macbeth’s fortress, hence verifying the prediction of the witches. Macbeth did not grasp the equivocation. Reference. “Merchants of Doubt” by Naomi Oreskes and Erik Conway. This entry was posted in Amusing Shakespeare, Best Shakespeare Quotes, Fighting your Adversary, Presentation Ideas, Shakespeare in Politics, Shakespeare on Mass Psychology and Group Behavior, Social Exchanges Shakespeare style and tagged best shakespeare quotes, communists, effective communications, global warming, watermelons. Bookmark the permalink.